Securing facilities, grounds, and access points have become increasingly challenging given current global and domestic climates. Protecting citizens, employees, students, and government employees is becoming complex and security teams need to be properly equipped. The list of applications is quite long and includes some of the following: fueling stations, sports facilities, theme parks, border crossings, military installations, manufacturing environments, schools, government facilities, and many other commercial-industrial facilities. In every design, we consider unique environmental and safety needs to protect all occupants and content. HVAC, intrusion such as earthquakes, hurricanes, and ballistics. Ask us about our ADA compliant offerings with 1, 2, and 3-hour fire ratings. With a variety of material and feature options, our configurations are highly customizable. Our brick, steel and/or aluminum construction includes options for proof glass, HVAC, guard arms, and special wiring. Every BSC solution lives up to our commitment to deliver durable, safe, comfortable and secure stand-alone guard stations. Ask us about GSA. What’s more, these booths are specifically designed for ease of transportation (they can be easily relocated with a forklift or crane), and this construction makes them naturally stronger than other types of booths. Guard booths are standalone units that are meant to protect the occupants from a variety of elements, and sometimes that means providing safe refuge from the heat or cold. With HVAC-equipped guard booths, you can rest assured that your employees will be safe and comfortable in their working environments, regardless of what the weather is doing. When you need a guard booth that’s comfortable, but that also offers maximum security, then you need a welded steel booth. Not only are they durable and enduring, but they’re also low-maintenance and come with customizable security features depending on your needs and location. Unfortunately, the weather isn’t always the only thing your employees need protection from, and when you have heightened security needs, then a ballistic building is the way to go. Along with having a welded steel base and frame, these units are covered with a strong steel sheeting that makes them compliant as bullet-resistant according to both UL and National Institute of Justice ratings. 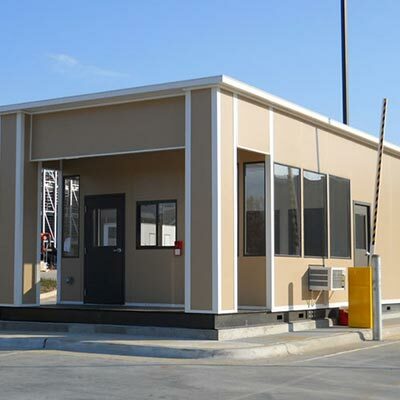 Another added safety feature you can customize your guard houses with is ASTM-certified fire-resistant wall panels, which have a fire endurance rating of 60 minutes, meaning a booth outfitted with these panels could withstand a fire for an hour. At BSC, we understand how critical your security needs are, and that’s why we’ve partnered with Panel Built for all your guard booth needs. As a General Services Administration (GSA) contract holder, Panel Built guarantees the highest quality products and service, the best value, and the fastest service. BSC has helped to equip many organizations and agencies with guard booths that will protect employees, provide a safe and secure workspace, and provide shelter from anything such as weather or bullets or fire. Even though these products are often used in military and correctional situations, there are many other applications for guard booths as well, and organizations in a wide array of industries have used these high-quality and reliable products to secure and protect personnel. 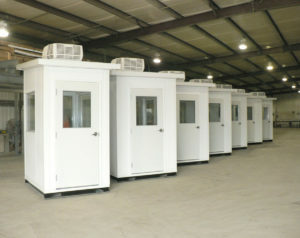 Wondering how much it would cost to outfit your facility or organization with a guard booth? Contact BSC today for a free assessment and quote.